(Ascendant, Leo, varying from the second degree to the thirteenth degree depending upon which of the two times is correct); MC, Aries; Sun, Mars, Mercury and Uranus in Scorpio with Mars conjunct the Sun and also closely conjunct Chiron; Moon in Capricorn; Venus in Libra; Jupiter in Libra, H3; Saturn in Sagittarius conjunct Uranus in Scorpio; Pluto retrograde widely conjunct Neptune retrograde in Gemini, 11, oppose all other planets). The earlier time seems to make the most sense, as it places two powerful planets in the fifth house instead of the fourth, emphasizing Goebbels’ “stage managing” and theatricality, and his role as ingenious creator of mass spectacles (Uranus in H5) and as one increasingly responsible for the control and even repression of cultural expression (Saturn in H5). “Let Maya flourish and deception rule” (the mantram describing the negative use of Scorpionic energy) might well be called the theme of Goebbels’ life. He was the chief architect of the “Big Lie,” (Jupiter in Libra in H3 widely square Neptune in Gemini) which, for the sake of promoting Nazi ideology, totally distorted every vestige of truth. The hardness of his nature, and his inability to feel the effects of what he was doing can be attributed to the Moon falling in Capricorn in the sixth house where “matter reigns”. His Nazi orthodoxy is reinforced by rigid Saturn in sixth ray Sagittarius. Pluto and Neptune, the negative sides of which indicate obsession and possession (Pluto), illusion (Neptune) and the unscrupulous quest for purely personal power are separate from and loosely opposing all his other planets. Goebbels’ principal rays are the third and the sixth. He was what the Tibetan Teacher would call a “Manipulator of Souls” (related to his third ray), and to a strong degree a “Deluder of Souls” (related to his sixth ray as a subray of the second). His more violent co-workers were the “Destroyer of Souls” (first ray). 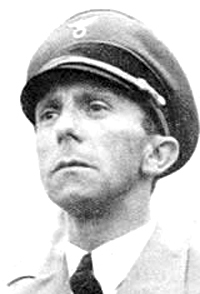 At one point Goebbels trained to become a priest, and the sixth ray, religious orientation underlies much the quality of his work for the Nazi party. A divided man (as are all those given to the Path of Evil) he was in a least one part of his nature a true devotee of Nazism. Leo, his Ascendant, a sign of creativity and apparent honesty. Goebbels took pride (Leo) in skillfully fabricating (third ray) an entirely false world-view in line with his ideology (sixth ray). Of all the Nazis, he most skillfully served the “Father of Lies”—the “Devil” as the personification of all the negative forces within the mass consciousness of humanity. 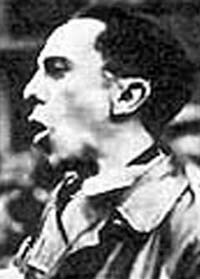 Joseph Goebbels was a brilliant, if self-deceived person. It is difficult to say whether his soul ray was the third and personality the sixth, or whether it was the other way around. Both rays (intimately related to each other) are capable of strong idealism. As the Tibetan Teacher points out, two time three is six. On the balance of the evidence, it would seem that the third ray of “Creative Intelligence” is most appropriate for his soul, and the sixth ray of fanatical devotion for his personality, with the fourth ray ruling the mind, the sixth ray his astral vehicle and the seventh ray the etheric physical body. The fact that he developed a clubfoot (Mars conjunct Chiron in the Pisces decanate of Scorpio — both planets of wounding), probably as the result of childhood disease, played a disastrous role in the development of his personal psychology. He developed an intense (sixth ray) need to compensate for this imperfection, and was driven to great and unscrupulous over compensation. He would sacrifice any principle for his own elevation (Leo) or for the elevation of the ideology (sixth ray) to which he was fanatically devoted (sixth ray). Goebbels’ main “stars” are most interesting. His militant Mars in warlike Scorpio is conjunct the star Zuben Elgenubi (a star of “positive social reform”). That he was involved in social reform cannot be doubted. The “positivity” of such reform existed only in his own deluded mind. 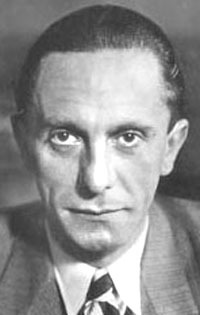 Goebbels’ brilliance (sadly misused) was augmented by the star of brilliance, Spica, parallel the planet of thought and mentality, Mercury (in Scorpio). The brilliance was prostituted to negativity. Regulus (the star of “law” and control) is parallel to Pluto. Since Pluto is one of the rulers of Goebbels’ Scorpio Sun and planets, this aspect becomes powerful; it is clear that he did not follow the “Good Law”, but the unholy law that “Might Makes Right”—the first ray compulsions of the planet Pluto. Uranus (the reformer) is conjunct to Toliman (a star of education and instruction). Again, we see that this potential was, indeed, alive and active, but used entirely negatively. Finally, the Ascendant is parallel to Arcturus (normally, with Spica, considered to be one of the most fortunate stars and giving the power to take a different approach and strike out on a new path. Goebbels certainly did this, fathering the “Big Lie”, creating a ‘new’ mythology based upon the power of ancient Nordic gods, and consequently leading millions astray on that new path to dense and destructive glamor and illusion. In his earlier years, he did not reveal such pathological tendencies. He received a strong academic training (third ray) graduating in 1922 with a Ph.D. degree in German Philology (again, third ray). After graduation he began a largely unremunerative journalistic career (third ray with Jupiter in third ray Libra in the third house of communication) and wrote some unsuccessful novels (inhibiting Saturn in the fifth house of creative self-expression). He was also interested in drama (Leo Ascending); unsuccessful in those days, his dramatic flair became amazingly successful as his power and authority within the Third Reich rose and his role as chief propagandist was confirmed and energized. Another evidence of expansive Jupiter in the third house (and of the third ray) were his four volumes of diaries, running to 2,841 pages (published in September 1987). The journals, dated from 1924 to early July of 1941, record Goebbels' development from a deeply religious (sixth ray) and literary-minded (perhaps the imagistic fourth ray mind) Catholic youth, to a zealous political organizer whose sole faith was in Adolf Hitler. 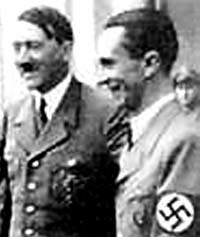 The sixth ray has to place is burning faith is something or someone; in the case of Goebbels, his choice was fateful. Germany’s defeat in WWI (the Jews were blamed for the Kaiser’s abdication), he was not originally anti-Semitic. The high school teachers he respected most were Jews, and at one point, he was engaged to a girl who was half Jewish. Even as Director of Propaganda for the Nazi Party, in which capacity he controlled, besides propaganda as such, the press, radio, theatre, films, literature, music, and the fine arts as well (Saturn in H5), his views were relatively liberal. Often, however, he had to capitulate to the demands of national extremists. This was his problem—he was always ready to trade principle for expediency (and example of one of the worst traits of the third ray). It said of him that “efficiency took precedence over dogmatism, expediency over principles.” If this assessment is correct, the third ray could be seen as ultimately more powerful than the sixth. Indeed his Capricorn Moon, and Jupiter in Libra would be strong channels for the inflow of the third ray. Interestingly, third ray Saturn is found in the very first degree of sixth ray Sagittarius, thus uniting the two rays. Goebbels, above all, was a master at the manipulation of the forces of glamor. It was he who began to create the Führer myth around the person of Hitler and to institute the ritual of party celebrations and demonstrations that played a decisive role in converting the masses to Nazism. Here we see him as a great deluder and deceiver (the power of his Mercury in the first degree of Scorpio, along with the Sun, Mars and Chiron also in that sign). Chiron the mentor and guide, when placed in Scorpio and functioning negatively, can also lead astray. The celebrations, demonstrations, and rallies offered a channel for his Leonian creativity, and for the power of Uranus (a creative seventh ray planet) in the house of creativity, the fifth. The German people (with their Pisces personality) were already negative and prone to glamor. Goebbels capitalized upon this tendency and, with impassioned, hypnotic oratory, and a devilishly clever command of language, wove a ‘spell’ around them, steering them deep into glamor and illusion—far from reality and sanity. From the end of 1929 until his death on May 1, 1945, his progressed Sun was in the sixth ray sign, Sagittarius. Mercury had already progressed there, and Mars followed the Sun shortly. These placements enabled Goebbels to create a great vision based upon a great illusion. 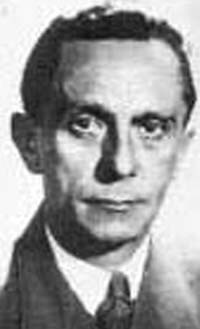 Goebbels was a strange mixture of cynic (third ray plus Moon in Capricorn) and fanatic (sixth ray Mars in Scorpio conjunct the Scorpio Sun, both eventually progressing together into the often fanatical sign Sagittarius). The sign opposed to Sagittarius is Gemini (the sign of knowledge and information). 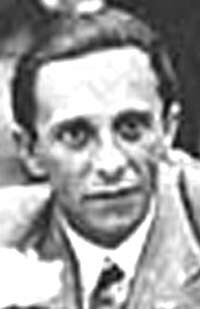 Goebbels had two planets in Gemini (Pluto and Neptune, both retrograde)—planets which, when expressed negatively, place the powers of thought and language at the disposal of the forces of delusion (Neptune) and darkness (Pluto). It is interesting to see how Goebbels power rose as the power of the third Reich declined—from the end of 1942 until the close of the War. The progressing Sun in Sagittarius had come into opposition with Neptune (the deluder and deceiver). The declining German nation was in need of new (and, of course, false) hopes and justifications. These Goebbels eagerly and ‘creatively’ provided in abundance. When all seemed to be losing their vision, he kept that albeit illusory vision alive—right until the very end. 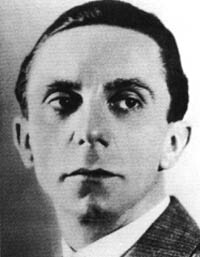 In fact Goebbels’ personal courage and bravery (Leo Ascendant and Mars conjunct Sun in Scorpio) seemed to increase as the German fortunes declined. Towards the end, he was the only Nazi who continued to appear publicly despite great personal dangers, and it was he who remained with Hitler in the last bunker when all others had fled (a tribute to the power of his sixth ray). Even “my loyal Heinrich” (as Hitler had affectionately called SS Chief, Heinrich Himmler—another Nazi with a powerful sixth ray) had, in the end, plotted against Hitler, hoping to command the German forces, leading them against the Russians and, thus, placate the righteous wrath of Allies’. That failing, he tried simply to sneak away disguised as a common soldier and was caught. Who is to say how history might have unfolded had Hitler pursued his art, Himmler his interest in agriculture, and had Goebbels remained a writer and journalist, attempting to live a more conventional creative life. That he was creative, there can be no doubt, but his creativity turned away from an expression of the higher impulses, and became the servant of darker forces which promised to compensate him for the wound to his psyche and body which his clubfoot symbolized. His life was one of pretense, inflation, false claims, lies, delusions, deceptions and cynical manipulation. He was indeed the “stage director” (Leo, the third and fourth rays) of one of the most ghastly spectacles humanity has every beheld. Somewhere in the process of becoming an “important person” (the longing of lower Leo), he lost touch with himself and with reality. It has been said that those among the inner group of seven, all including Hitler were obsessed or even possessed by powerful and hateful entities belonging to the “Black Lodge”.. A study of Goebbels’ psychology reveals how he abandoned his legitimate possibilities for a worthy life, and instead, opened the door to obsession through the longing for personal glory—a glory compensatorily attached to the rising and illusory glory of Nazism. It must be realized that the soul-enhanced potencies of the causal body are at the disposal even of those who veer towards the “Left-hand Path” (until all good is drained from the causal envelope). Some such powerful personalities are “initiates of the threshold” (first or second degree initiates) in their own right, but when given the opportunity to progress, they never choose love. They may choose sentiment and self-pity (weak reflections of the love energy); they may even choose devotion and dedication, but they seem not to rise above the solar plexus into the full energy of the heart. Goebbels was one such. He had many fine qualities and abundant talent, and apparently he ‘loved’ his wife and children. This did not prevent him from murdering them for the sake of his emotionally-driven ideal. One is tempted to look through the psychological miasmas for the “tragic flaw” in such cases. The complexities are many (and he was a most complex character), but in this and every other such case, it will be found to be a deep inferiority complex and a lack of love . Naturally the common people don't want war; neither in Russia, nor in England, nor in America, nor in Germany. That is understood. But after all, it is the leaders of the country who determine policy, and it is always a simple matter to drag the people along, whether it is a democracy, or a fascist dictatorship, or a parliament, or a communist dictatorship. Our movement took a grip on cowardly Marxism and from it extracted the meaning of socialism. It also took from the cowardly middle-class parties their nationalism. Throwing both into the cauldron of our way of life there emerged, as clear as a crystal, the synthesis - German National Socialism. Goering was born in Rosenheim, Bavaria to Heinrich Ernst Göring, a lawyer and colonial bureaucrat, and Franziska. Often apart from his parents, he was tutored at home before attending cadet schools at Karlsruhe and Lichterfelde. In World War I he was commissioned in the infantry, then became a pilot. He flew reconnaisance and bombing missions before becoming a fighter pilot. By the end of the war he was a highly decorated "ace" and commanded the famed Richthofen Squadron. In mid-1915 Goering began his pilot training at Freiburg, and on completing the course he was posted to Jagdstaffel 5. He was soon shot down and spent most of 1916 recovering from his injuries. On his return in November 1916 he joined Jagdstaffel 26, before being given his first command. In 1917 he was awarded the Pour le Mérite. On July 7, 1918, after the death of Manfred von Richthofen, he was made commander of Jagdgeschwader Freiherr von Richthofen (Jasta 11). He finished the war as an "ace," with 22 confirmed kills. Incidentally, he was the only veteran of Jasta 11 to have never been invited to the squadron's post-war reunions. In June 1917, after a lengthy dogfight, Göring shot down a novice Australian pilot named Frank Slee. The battle is recounted flamboyantly in The Rise and Fall of Hermann Goering. Göring landed and met with the Australian, and presented Slee with his Iron Cross. Years after, Slee gave Göring's Iron Cross to a friend, who later died on the beaches of Normandy on D-Day. He remained in flying after the war, worked briefly at Fokker, tried "barnstorming," and in 1920 he joined Svenska Lufttrafik. He was also listed on the officer rolls of the Reichswehr, the post-World War I peacetime army of Germany, and by 1933 had risen to the rank of Generalmajor. He was made a Generalleutnant in 1935 and then a General in the Luftwaffe (German air force) upon its founding later that year. In Stockholm he met Karin von Kantzow (née Fock, 1888-1931), whom he later married. She died in 1931, and soon after he married actress Emmy Sonnemann. As early as 1922, Göring joined the Nazi Party and initially took over the SA leadership as the Oberste SA-Führer. After stepping down as the SA Commander, he was appointed an SA-Gruppenführer (Lieutenant General) and held this rank on the SA rolls until 1945. Having been a member of the Reichstag since 1928, he became the parliament's president from 1932 to 1933, and was one of the key figures in the process of Gleichschaltung that established the Nazi dictatorship. In its early years, he served as minister in various key positions at both the Reich level and in Prussia, being responsible for the economy as well as the build-up of the German military in preparation for the war. 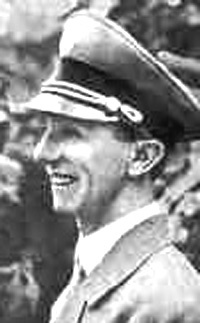 Among others, he was appointed Reichsluftfahrtminister in 1935, head of the Luftwaffe. In 1939, he became the first Luftwaffe Field Marshall (Generalfeldmarshal) and by a decree on 29 June 1941, Hitler appointed Göring his formal successor and promoted him to the rank of Reichsmarshall, the highest military rank of the Greater German Reich. Reichsmarshall was a special rank intended for Göring and which made him senior to all Army and Air Force Field Marshals. The Reichstag Fire, according to the Nuremberg testimony of General Franz Halder, was the handiwork of Göring, not of 'Communist instigators.' "At a luncheon on the birthday of Hitler in 1942..." Halder testifies, "[Göring said]...The only one who really knows about the Reichstag is I, because I set it on fire!" "With that," said Halder, "he slapped his thigh with the flat of his hand." Goering in his own Nuremberg testimony denied this story. Göring was known for his extravagant tastes and garish clothing. As the only major Nazi with a prominent World War I record, he was a key connection between the former corporal Hitler and the traditional military elite. Göring, married to a Swedish baroness, exulted in aristocratic trappings and built up a considerable estate, Karinhall, in Prussia during the Nazi period. Handsome and athletic in his youth, a painful injury sustained during the Beer Hall Putsch left Göring dependent on narcotic painkillers, particularly morphine, and contributed to his later obesity. Once World War II started, Göring became the driving force behind the failed attempt to force Britain's surrender (or at least acquiescence) by air battle in the Battle of Britain. After that campaign he lost much of his influence in the Nazi hierarchy, exacerbated by the Luftwaffe's failings in Russia and against the Allied bomber raids. His reputation for extravagance made him particularly unpopular as ordinary Germans began to suffer deprivations. Göring was the only WWII recipient of the Grand Cross of the Iron Cross, awarded to him by Hitler for his leadership of the Luftwaffe during the conquest of France and the Low Countries. He avidly pursued additional decorations, in marked contrast to Hitler, who wore only what he earned in WWI. Göring also sponsored a ground combat unit, the eponymous Hermann Göring Division, which fought on various fronts with mixed success. Göring was also placed in charge of exploiting the vast industrial resources captured during the war, particularly in the Soviet Union. This proved to be an almost total disaster and little of the available potential was effectively harnessed for the service of the German military machine. However, Göring became notorious among the Nazi elite for pilfering art and other valuables from occupied Europe. Göring was the highest figure in the Nazi Hierarchy who had authorized on paper the 'final solution of the Jewish Question', when he issued a memo to SS Obergruppenführer Reinhard Heydrich to organize the practical details (which culminated in the Wannsee Conference). It is almost certain however that Hitler issued a verbal order to Göring in the fall of 1941 to this effect. In his political testament just before his own suicide, Hitler expelled Göring and Heinrich Himmler from the party and from all offices of State for disloyalty to him, for negotiating with the enemy without his knowledge and against his wishes, and for illegally attempting to seize power in the State for themselves. This referred to a telegram which Göring sent from Berchtesgaden to Hitler in Berlin on April 23, 1945, in which he offered to take command of the Reich as Hitler's designated successor. Hitler accused Göring of high treason, stripped him of all his offices, and had him placed under arrest by the SS on April 25. Göring surrendered to American troops on May 8/9, 1945 in Austria and was the highest ranking Nazi official brought before the Nuremberg Trials. Though he defended himself vigorously, he was sentenced to death; the judgement stated that "his guilt is unique in its enormity". One of his last acts was to ask his brother Albert Göring to look after his wife and daughter. Defying the sentence imposed by his captors, he committed suicide with a cyanide capsule the night before he was supposed to be hanged. Where Göring obtained the cyanide, and how he had managed to hide it during his entire imprisonment at Nuremberg, remains unknown. In the 1950s, Erich von dem Bach would claim that he had given Göring the cyanide shortly before Göring's death; however, this claim is most often dismissed. Modern day theories speculate that Göring had befriended a U.S. Army Lieutenant, stationed at the Nuremberg Trials, who had aided Göring in obtaining cyanide which had most likely been hidden in Göring's personal effects confiscated by the Army. In 2005, a retired Army private, Herbert Lee Stivers, claimed that he delivered "medicine" hidden inside a fountain pen to Göring from a German woman he had met and flirted with. Stivers served in the US 1st Infantry Division's 26th Regiment, who formed the honor guard for the Nuremberg Trials. Stivers claims to have been unaware of what the "medicine" he delivered actually was until after Göring's death. After his suicide, Hermann Göring was cremated and his ashes were scattered into the Isar river. 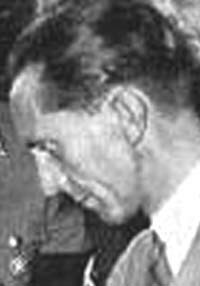 Göring's last days were spent with Gustave Gilbert, a German-speaking intelligence officer and psychologist who was granted free access by the Allies to all the prisoners held in the Nuremberg jail. Gilbert kept a journal of his observations of the proceedings and his conversations with the prisoners, which he later published in the book Nuremberg Diary. The following quotation was a part of a conversation Gilbert held with a dejected Göring in his cell on the evening of 18 April 1946, as the trials were halted for a three-day Easter recess. Göring: Why, of course, the people don't want war. Why would some poor slob on a farm want to risk his life in a war when the best that he can get out of it is to come back to his farm in one piece? Naturally, the common people don't want war; neither in Russia, nor in England, nor in America, nor for that matter in Germany. That is understood. But, after all, it is the leaders of the country who determine the policy and it is always a simple matter to drag the people along, whether it is a democracy, or a fascist dictatorship, or a parliament, or a communist dictatorship. Göring: Voice or no voice, the people can always be brought to the bidding of the leaders. That is easy. All you have to do is tell them they are being attacked, and denounce the pacifists for lack of patriotism and for exposing the country to danger. It works the same in any country. and Hitler's designated successor.was born in Rosenheim on 12 January 1893. The son of a judge who had been sent by Bismarck to South-West Africa as the first Resident Minister Plenipotentiary, Goering entered the army in 1914 as an Infantry Lieutenant, before being transferred to the air force as a combat pilot. The last Commander in 1918 of the Richthofen Fighter Squadron, Goering distinguished himself as an air ace, credited with shooting down twenty-two Allied aircraft. Awarded the Pour le Merite and the Iron Cross (First Class), he ended the war with the romantic aura of a much decorated pilot and war hero. After World War I he was employed as a showflier and pilot in Denmark and Sweden, where he met his first wife, Baroness Karin von Fock- Kantzow, whom he married in Munich in February 1922. Gave a spiffy medal to Charles Lindbergh. Committed suicide before the hangman could do his work. 12 Jan 1893 Hermann Goering born, Rosenheim, Bavaria. 1904 Sent to boarding school, Ansbach, Franconia. 1918 Becomes commander of the Red Baron's former squadron. 3 Feb 1922 Hermann Goering and Baroness Karin von Fock-Kantzow marry, Munich. 1925 Becomes a morphine addict. Sep 1925 Enters Långbro mental hospital, Sweden.Sep 1925 Becomes a morphine addict. 1928 Wins a seat in the Reichstag. 17 Oct 1931 Wife Carin dies of tuberculosis.26 Oct 1933 Elected President of Reichstag. 26 Apr 1933 Hermann Goering founds the Gestapo.30 Jun 1934 Hermann Goering assists in the Night of the Long Knives. 19 Apr 1935 Harmann Goering and actress Emmy Sonnemann marry. 2 Jun 1938 Daughter Edda born, only child. 19 Jun 1940 Becomes Reichsmarschall. 31 Jul 1941 Orders Heinrich Himmler and Reinhard Heydrich to bring "about a complete solution of the Jewish question in the German sphere of influence in Europe." 9 May 1945 Captured by the American Seventh Army. Mar 1946 Wife Emmy Sonnemann released from prison, Straubing. 15 Oct 1946 Commits suicide with a poison capsule, on the day he is to be hanged.1967 Contents of a note released, explaining that the poison capsule was hidden in a pomade container. 8 Jun 1973 Wife Emmy Sonnemann dies, Munich. Attorney Melvin Belli handles the estate.